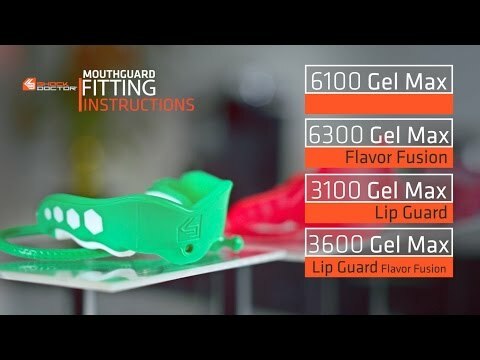 Gel Max Mouthguard is rated 3.7 out of 5 by 11. Rated 5 out of 5 by Travis from Great fit! Excellent quality. I ordered this mouthguard on line and when it arrived, I thought, thereâ€™s no way this is going to fit, it looks way to small. After following the instructions, boiling it the proper amount of time and fitting it the way itâ€™s explained in the instructions, it fits perfectly. Boiling it really softens the whole thing and it molds to the shape you need it to then it hardens and stays in the perfect shape. Great product! Rated 5 out of 5 by Charlie D. from Quality Provides Confidence When a product is well made the security of knowing that you have the best possible protection allows you to go all out and not worry about injury. Rated 1 out of 5 by Nikki from Way too small I bought my 8 yr a YOUTH one of these and realized it was WAY too small 2nd day of practice. How can I return a worn mouthguard? So I ate the money went and bought a new ADULT one. I compared them in package it was bigger so I figured ok this will work it has to it's for ADULTS! Of course not he puts it in his mouth and it's way too small STILL! He is 8 how is this possible. Of course the only way to open box is to tear it. Im very unhappy! I have to eat $20 bucks on 2 mouthguards that dont fit and now go find and buy 1 that does??? Waste of money!! Rated 1 out of 5 by Lynn Clarke from Switch to Convertible model ruined it for me I used to use the strapless Gel Max mouthguard all the time (for years) and it worked just fine. Now they have gone over to a 'convertible' model which has a rather large bulge in the center to accommodate the "convertible strap" and it now feels totally uncomfortable. I bought 2 more before I realized they had made this change, and both will be going in the garbage and I'll be looking for something new. Such a shame. Rated 3 out of 5 by Sarah from Convertible Tether is Poor - Best used without it This is a great mouth guard if you don't intend to use the convertible tether, but if you want or need the tether on your helmet, this is not the mouth guard you want. During my son's first practice the tether kept popping out of the mouth guard and we actually ended up losing the tether all-together in the grass somewhere. Rated 5 out of 5 by Charles from Excellent mouthguard! This mouthguard is excellent. It is confortable, easy to mold and sticks to your teeth with the gel. I really recommend it. Rated 1 out of 5 by Justin from Size too small I followed the instructions to a T but I can't stretch it enough to bite into it and mold it. I soaked it in boiling water multiple times and tried to stretch it before putting it in my mouth and biting but its just too small for me. Please help me with this.